By Xah Lee. Date: 2013-11-07 . Last updated: 2014-04-04 . Here's how you can mount it on Linux via USB connection. • plug in the USB between PlayBook and Linux machine. 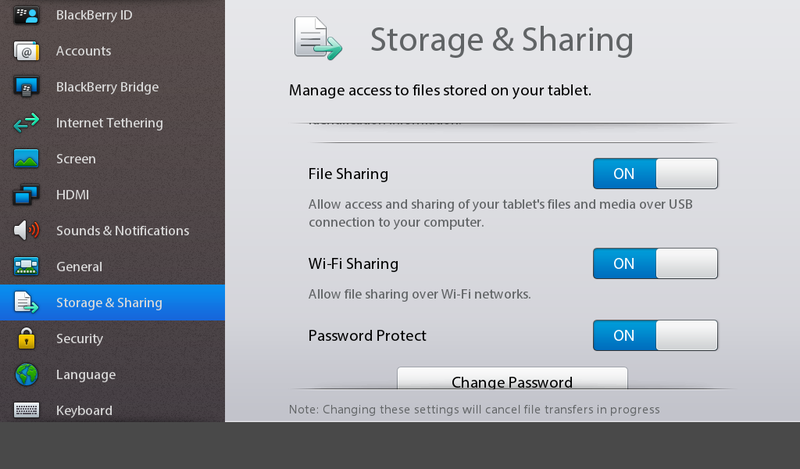 • on PlayBook, go to 〖Storage and Sharing〗, set the menu “USB Connections” to “Connect to Window”. In the “File Sharing” section, turn it on. 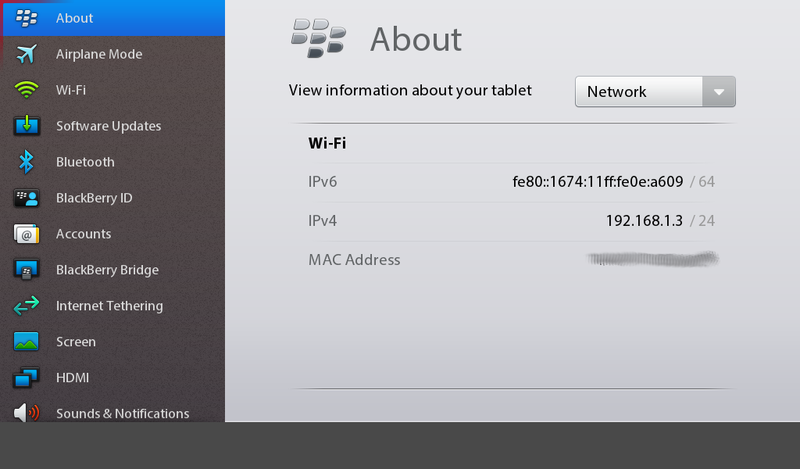 • on PlayBook, go to 〖About〗, find the USB IP address of the PlayBook. In the About screen, the Network menu. Note, it's the USB's IP address, not the wifi ip address. on Linux, just open a folder, press 【Ctrl+l】 to show the address bar, type smb://169.254.134.77/, where the IP is the Playbook's IP. Summary: if you downloaded a zip file that expanded, and is unable to delete them later in your file manager, you probably have to do a security wipe. i downloaded the python doc in pdf (http://docs.python.org/3/archives/python-3.3.2-docs-pdf-letter.zip) on PlayBook. It's a zip file. Touched the screen to unzip. They expands to tens of pdf files, clutter my files. So, i want to delete some of them. But, it says unable to delete. fine, connect to my linux, and i though i should be able to delete them there, with rm or sudo or chmod etc. 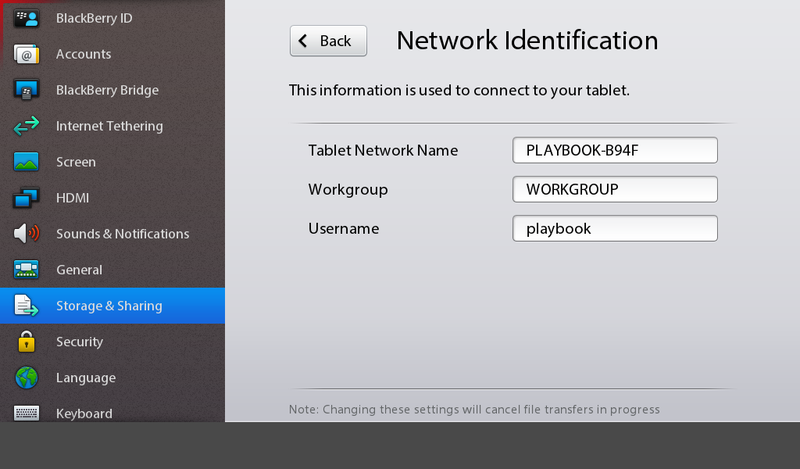 (PlayBook doesn't support linux, so you'll have to smb the usb ip, for example: smb://169.254.134.77/). Still, says perm denied. Ok, after a while finding where smb is mounted, it's at ~/.gvfs/ (press 【Ctrl+h】 to show hidden file). Then try sudo rm -rf. No go, still perm denied. Try sudo chmod 777 ., no go. so, the problem is you have a tens of files in your PlayBook you can't delete. Search the web, there's few reports too, saying you have to security wipe. WTF? then, perhaps i should jailbreak it, but that means who knows how many hours i'll have to put in. BlackBerry PlayBook is the worst tablet.